It has taken me quite a while now to finish this book, wanting to read it before I delve back in to Connie Willis' To Say Nothing of the Dog. I have enjoyed it, but found it slow. I think it is maybe one of those books that get better with sitting. I like it more now that I've had time to think on it. I'm not going to offer much of a summary, because there's not much to summarize, other than perhaps point to the title, and mention that the boat is on the Thames, and the time is Victorian. That's about it, really. They awe us, these strange stars, so cold, so clear. We are as children whose small feet have strayed into some dim-lit temple of the god they have been taught to worship but know not; and, standing where the echoing dome spans the long vista of the shadowy light, glance up, half hoping, half afraid to see some awful vision hovering there. Just for that passage alone I am glad to have read this book. In the same way that much of the description and humour is overstated, much of the action is understated. One gets the impression that J. and his friends George and Harris (to say nothing of fox terrier Montemorency) are on their way down the Thames, and that things are happening, but one is never quite sure until very occasionally something of note happens. And once I realized that it was going to continue in that vein, with more asides about stories J. has heard and flights of fancy about history and a few memories, the happier I was to just settle in. It has a bit of a feel of a long dinner-table conversation, over which plenty of delicious food is consumed and the wine glasses keep getting refilled. Some things get mentioned that I wish were filled out a bit more, and other stories take strange but almost always amusing and interesting tangential turns. I got a tantalizing taste of the Victorian, in a way that makes me feel steeped in that moment. This is a relaxed read with almost no plot, and when approached that way is very satisfying. One thing of note, that made me realize just how human this book is and that not much fundamental has changed: How many of us have, when confronted with a series of symptoms, looked up those symptoms on Wikipedia or some other internet site? And then read on, convinced that one has contracted something absolutely horrifying and likely exceedingly contagious? I've heard it mentioned that this is a particular problem of the internet: it feeds hypochondriacs. Not so. There is an extended moment (they usually are) near the beginning of Three Men in a Boat in which the narrator, upon looking up a condition in a medical tome in a library, becomes convinced that he has everything in the book, save housemaid's knee. It was a passage I recognized myself in, even if my tools are different. A thanks to Nymeth, who originally brought this book to my attention well before I was told to read the Connie Willis. If you want to read it and can't find yourself a paper copy, which proved rather challenging for me, the Gutenberg Project has a copy online for free. Yep, this definitely has the feel of a long, rambly dinner table conversation! It does take some getting used to, but once I did I so enjoyed the experience. Also, I love how you pointed out that so much of it is timelessly human. 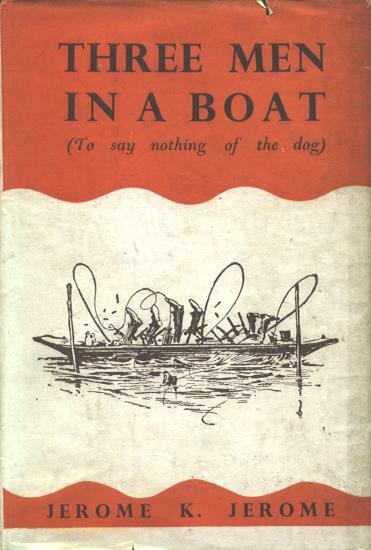 I love, love, love Willis' To Say Nothing of the Dog but I have never managed to read Three Men in a Boat. Perhaps I need to? Thanks for the link to the e-book. I am really looking forward to getting back to the Willis. Just from the bit I read, I am certain I will enjoy it. I'm one of those people who has to compulsively read what went first, though, so I decided I'd try this first and then go back to To Say Nothing of the Dog. It may not have been necessary or even really useful, but I've enjoyed the journey. I've read this many times, and I do love it, even when it gets a little boring. :<) But so much of it is lovely. And I would love to take just such a trip. Wouldn't it be lovely? I have a fascination with boats of all kinds, and I love the idea of doing a river trip someday. This book is a good advertisement for the idea. Humor is very hard to write. Jerome K. Jerome does a fine job in his "Three Men in a Boat" -- it's a light, frothy sort of humor that brings to mind a 60's comedy movie. The characters are irritable and inept, and the things that tick them off (packing luggage, setting up a tent, dealing with women in nature, cooperative rowing) are still very relevant today. For example, people who hate jet-skis can find parallel rants on the steam-powered launches that annoy Jerome and his sailing buddies. The occasional dips into seriousness (English history, a single-mother suicide) take up a net 2 pages total, and don't happen to detract from the overall humor. My favorite line is spoken by Jerome to the overzealous cemetary watchman, who can't believe Jerome doesn't want to view some open tombs: "Leave me immediately or I shall climb over the fence and slay you." I'd forgotten the cemetery bit, but your reminder did make me giggle out loud. Thanks!